Towards a world where migration is a right and a choice, migrants are accorded the full range of human rights, the securitization of migration and the criminalization of migrants and refugees is ended, the root causes and historical injustices that create forced migration are eliminated and their sustainable contribution to the development of societies of sending and receiving countries is recognized and valued. This year, the 10th Global Forum on Migration and Development (GFMD) takes place in Germany amid an escalating global crisis of people fleeing from wars and conflicts, political and religious, gender, racial and other forms of persecution, climate change impacts and economic hardships brought about by neo-liberal policies that have impoverished countries of origin of migrants and refugees. The conference is taking place amidst a global migration and refugee crisis that has witnessed the flight of millions of people fleeing extreme poverty, from countries destroyed by resource wars and wars of aggression, and devastated by climate change impacts. It is being hosted by Germany, a country that in recent years has seen an unprecedented influx of migrants and refugees asserting their fundamental right to freedom of movement and crossing multiple borders, determined to find safety, security and a better life within their territory. The unprecedented number of refugees entering Europe since 2014 stems from the widespread armed conflicts in Syria, Afghanistan, Iraq, Palestine, Libya, sub-Saharan Africa and other nations, and as a result of the global economic crisis that has mired many developing countries in deepening poverty, indebtedness and underdevelopment. In 2015, the number of refugees entering Europe via Italy and Greece hit its peak, reaching over a million people, according to the UNCHR. But even before the so-called refugee crisis peaked in 2015, there are already about 12 million people living in Europe as undocumented migrants facing their own particular challenges and problems. Under the guise of creating “legal, orderly and safe migration pathways and channels”, discriminatory and racist policies of pre-selection allow only ‘highly-skilled and knowledge migrants’ to access and enter the territories of European Union member states. This right is denied to majority of those who are the most impoverished and vulnerable who seek a better life, or those who are victims of various forms of persecution. This policy also effectively discriminates and criminalizes the majority of migrants and refugees who have already entered and established their right of abode in the European Union. A case in point is Germany’s schizophrenic policy that received close to a million migrants and asylum-seekers in 2015, at the same time as it prepared to deport over 200,000 ‘irregular’ migrants, among them the undocumented, the ‘economic migrants’ and rejected asylum-seekers. Those profiled as ‘irregulars’ face arrest, detention and massive deportation. The response of governments and the policies of receiving countries has mainly been to securitize migration by intensifying crackdowns, closing off borders, building walls and criminalizing especially the most vulnerable sectors among migrants and refugees. Their right to freedom of movement, to seek refuge and sanctuary, to find and enjoy a humane existence and other attendant rights are coming under severe attack. The establishment of Frontex in 2004 and the implementation of the EU Return Directive in 2008 have been the punitive and inhumane response of most governments to the problem. And in light of the ever-worsening economic crisis of European Union countries and pervasive austerity measures that profoundly impact on access and delivery of social services to the local population, governments have increasingly adopted xenophobic rhetoric that scapegoats migrants and refugees as the cause of the continuing crisis of neo-liberal globalization. This has resulted in the further disenfranchisement and marginalization of migrants and refugees, already profiled as second-class citizens. The 7th International Assembly of Migrants and Refugees believes that the multi-level and supposed inclusive nature of the strategies promoted by the GFMD is illusory at best, in fact deceptive, given its lack of attention to structural and long-term solutions that would decisively address the underlying and causative problems in international migration – the forced dispersal, displacement and dislocation of human beings and their communities – forced migration. Unless historical injustices and the root causes and consequent problems of forced migration are recognized and addressed, the United Nation’s “Global Compact on Migration and Human Rights” proposing an enhanced global migration policy, will remain a ‘band-aid’ solution to the urgency and gravity of confronting the multiple crises of a global economic and political system run amok that puts the interest of big business and profit first over the sustainability of the planet and the preservation and propagation of the human race. We should begin with the premise that any discussion about migration and social development should fundamentally involve the refugees, migrants, and other social sectors most affected by the continuing global economic crisis, extreme poverty and unemployment, wars of aggression, and impacts of climate change. The migration and development discourse within the GFMD should be fuelled by the direct participation and genuine voice of migrants and refugees. Only their active participation can guarantee that policy proposals generated will eventually resolve the root causes of forced migration, displacements and dislocation of peoples. END Criminalization, Racism, Marginalization and Impunity of Attacks against Migrant and Refugee Rights! PROMOTE migrant, refugee and frontline communities’ genuine, long-term and sustainable solutions to the migration and development debacle! 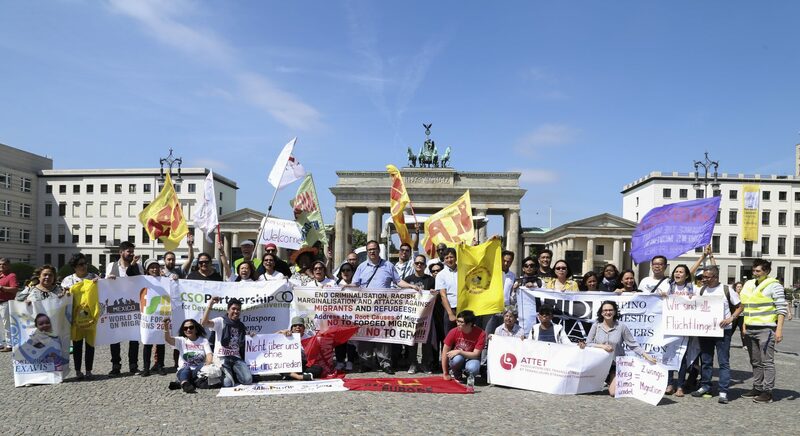 The International Migrants Alliance (IMA), in cooperation with the Asia Pacific Mission for Migrants (APMM), GABRIELA Germany, IBON International, the International League of Peoples’ Struggle, the International Women’s Alliance, MIGRANTE Europe, MIGRANTE International, and supported by the Churches Witnessing with Migrants, Coalition Against Trump, Courage, Democracy in Europe Movement 25-Berlin, Die Linke International, and Solidarity International. This event is finished. Contact us to get involved in future ones!